Bringing a new cat into the household raises the question of how to introduce a cat to a dog or a cat to another cat. Introducing a cat to a dog or another cat takes time and more importantly, a lot of patience and commitment on your part. So, today I’m going to offer you some tips to ensure the peace and quiet in your home. RELATED: Why Do Cats Hiss at Kittens? A few days back I read a heartbreaking story on Facebook. A woman was grieving because her new cat died. No, the cat wasn’t ill or hit by a car. The dog killed it, which as many other people pointed out was utterly avoidable. That’s what could happen if you don’t introduce your cat to your dog in the correct way. So, don’t take it lightly when you bring a cat into the house, even if your dog has lived with felines before. Before you begin introducing Rover to Kitty, allow Kitty enough time to settle in your house. Kitty is already stressed enough by the sudden change in her environment, so it’s a horrible idea to bring Rover into the picture. Keep Kitty confined in one room with everything she needs – litter box, food, and water bowls. Your bedroom is an excellent choice or another place where Rover doesn’t have access. Wait until Kitty gets used to the new situation and warms up to you. If she hides under the bed or the furniture, let her be. Once she seems comfortable and relaxed, you can start the introductions. Also, when you bring the cat into the house, the dog should be either locked in or away from home. Otherwise, it’s very likely that Rover will be barking at the cat carrier and that will freak out Kitty. You can do this step in stages. Start by petting the dog for a few minutes. Then go to the cat’s room and let her sniff your hand. Then pet Kitty for a while and return to Rover and let him smell your hand. The point of this exercise is to get the two animals comfortable with the scent of the other. You should keep doing it for a while until neither animal gets excited or scared by the smell. Then you can continue to the next step. Take Rover to the door of the bedroom and let him and Kitty sniff each other through the solid wood. If Rover starts scratching at the door, barking, or whining, you must remove him immediately. Try again later when Rover is calm. To encourage bonding, you can start feeding the animals on the opposite sides of same the door. In this way, they will associate the unfamiliar scent with something positive – food. Continue to do so, until both animals don’t seem to mind the scent of the other. Place a barrier, for example, a tailgate and allow both animals to look at one another. Let the cat/dog explore the other animal and step in immediately if you notice signs of aggression like barking or hissing. Allow enough time to either animal to get comfortable. It might take up to a few weeks, but under no circumstances force the animals to interact if they seem reluctant or uncomfortable. It’s also a good idea to have a high place where the cat can escape if it feels threatened. Next, when both animals don’t react strongly, you can keep the dog on a leash and let the cat loose in the room. Observe Rover and if you see that he gets too excited, remove him from the room. The same goes for Kitty. You might also start teaching Rover to ignore the presence of the cat. Do so by providing treats when he focuses too much on the cat. In this way, Rover will learn that not bothering the cat results in tasty food. 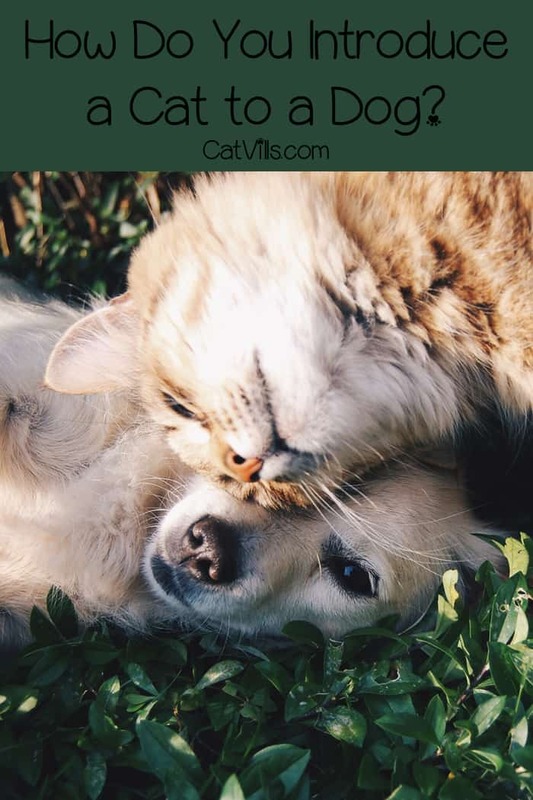 If things are progressing well, meaning your dog behaves calmly around the cat and the cat doesn’t seem bothered by the dog, you can forget about the leash and let both animals loose in the room. Do not leave them alone, but continue to monitor their behavior. Keep the first few sessions short and slowly increase the time. 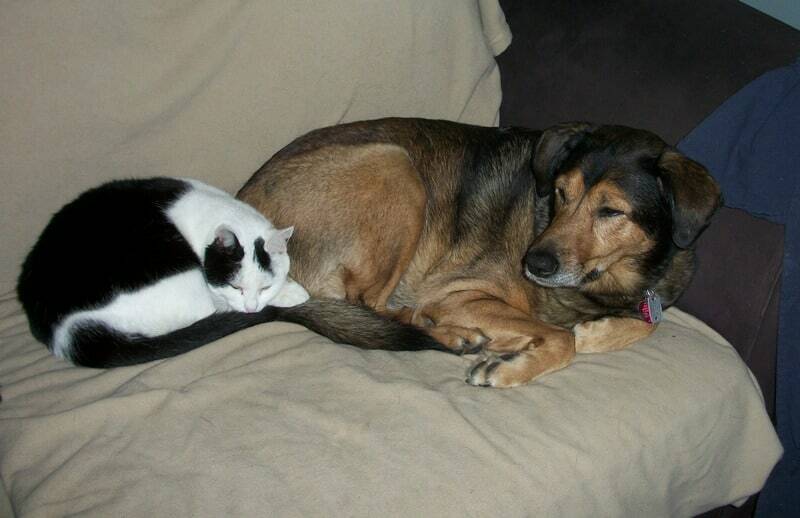 In time, you’ll probably start to notice that Kitty and Rover are cuddling together or playing. That’s a very good sign and shows that the bonding is going on well. 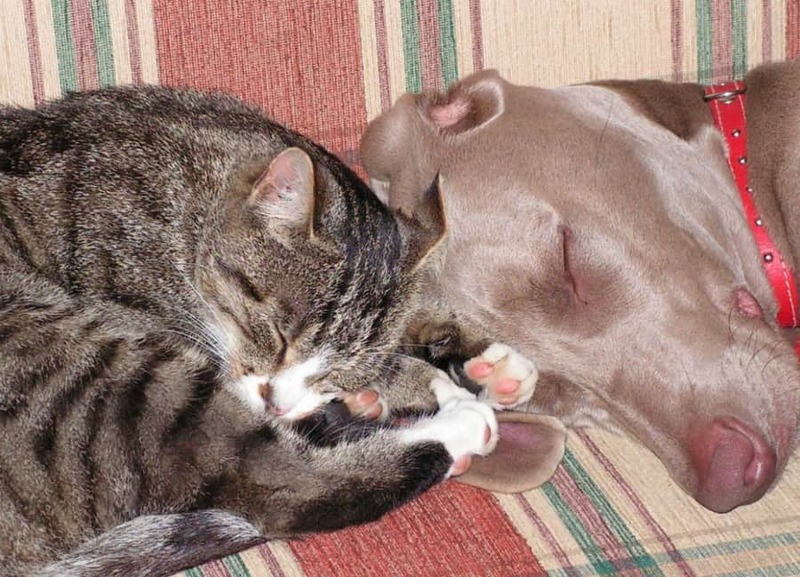 However, when you’re not at home, do not allow the dog to have access to the cat. That’s imperative for breeds with high prey drive, like the Greyhound. How to introduce a cat to another cat? Introducing a cat to another cat is not so different than introduce a cat to a dog. However, there is something you must keep in mind. Cats have a strong territorial instinct and don’t like to share. So, they might never be best friends with one another. Is it neutered? If it’s not, it’s better to do it before you get another cat. Unneutered males can be quite dangerous to kittens and other male cats. Does your cat like to play? Then it probably won’t mind a playful companion. But if it doesn’t a kitten might not be the best choice for you. Has the cat ever lived with another cat? A cat who has been an only child will get used to a new kitten quite hard. The new cat needs its space and territory. So, decide where you’re going to keep the new cat for the first weeks. You have to furnish the place with all the necessary cat stiff and make sure that Kat doesn’t have access to it. In time, Kitty will show you that she is ready to explore the rest of the house. Then you swap your cats’ places. You bring Kat into Kitty’s territory and Kitty’s into Kat’s. Just like when you’re introducing a cat to a dog, place the food bowls on either side of a closed door. In this way, you’re allowing the kitties to get familiar with each other without visual. At first, you might have to place the bowls a little farther from the door, if the cats seem afraid or reluctant. 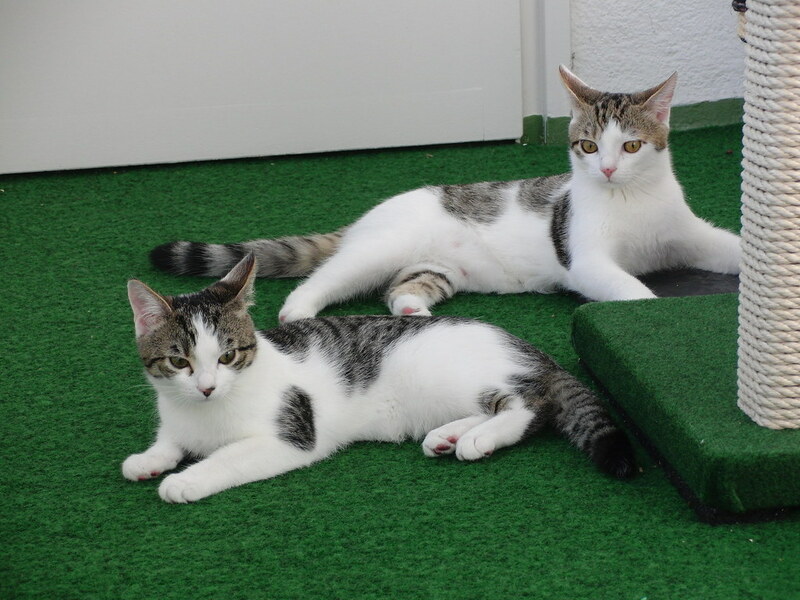 Once you deem that both cats are ready, open the door, but place a barrier between the two. ou can use a pet gate or a screen door. The cats might sniff each other and hiss or growl. That’s normal. Continue to feed them in the same way until they seem comfortable or at least resilient with the other feline’s presence. Finally, when you see that both cats seem calm around each other you can bring them together in one room. The trick here is to keep them both occupied so that they don’t turn attacking each other. You might want a second person’s help because you will find it hard to keep the attention of two curious felines all by yourself. In time, the cats will get used to this routine and hopefully, accepts each other’s presence in the house. But don’t be surprised if it takes you a few months until your fur babies start to get along. What do you think about these tips on how to introduce a cat to a dog and a cat to a cat? Share your thoughts in the comment section. We’d love to hear how you did it. This is a really helpful guide! I actually went through this when I had to introduce a rabbit to my dog and it was strikingly similar. I don’t have pets but this was a very interesting read. I’ve never thought there to be a process of introduction. I guess I always thought that they’d know if they liked each other or not. Very useful for pet owners. I will introduce to a coworker because we had a convo about how her dog doesn’t like the cat. And they have to separate the two before bed. This is quite the process but it is worth it. Personally, I’ll stick to one or the other.